I know that Chris Rose from Fox would rather be calling the World Series of Poker or hosting Best Damn’s Top 50 Baseball Bloopers, but I guess being on the field with the New York Yankees for their 27th World Series Championship will have to do. 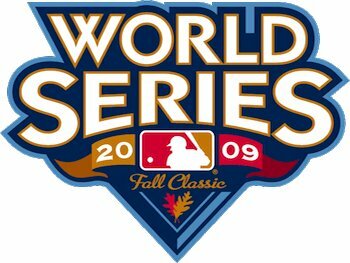 in the 2009 World Series. Bombers to open up the series. offense found a way to ding CC Sabathia and the Yankee bullpen for six runs. strikeouts of Alex Rodriguez and Jorge Posada to finish with a flourish. order went a combined 3-for-28 with nine strikeouts. Rodriguez and Mark Teixeira each went 0-for-4 and fell victim for five of Lee’s 10 K’s. York bullpen helped widen the margin of victory. pitches in allowed four insurance runs over the final two innings. For comparison’s sake the Yankee relief line serves to underscore exactly how economical Lee was over a full night’s work – and against one of the toughest offenses in all of baseball. Utley has been a postseason hitting machine, setting a record by reaching base for the 26th consecutive playoff game with his third inning homer last night. A.J. Burnett of the Yanks taking on Pedro Martinez for the Phillies. Los Angeles Dodgers for seven innings in his only postseason start. Angels in Game 5 of ALCS. all too well from previous wars while a member of the Boston Red Sox. offense has been brilliant at home throughout 2009.
against the righty. Teixeira has faced Martinez only six times (1-for-6, 3 K’s). hallmark of a team that makes the most of its opportunities. The Yankees just don’t strike me as a team that will lose back-to-back games of a World Series at home. Sure, the 1996 World Series is a fine example of their ability to bounce back, but the Yankees will be looking to even things up behind A.J. Burnett this evening. If the Phillies can take a 2-0 lead back home, then it may be all down hill from there. Frankly, I believe the Yankees will bounce back sooner than later.